is one of our selected horse games which can be played for free at horse-games.org. It has been played 5246 times and has been rated from administrators of horse-games.org with 4.60 stars out of 5. 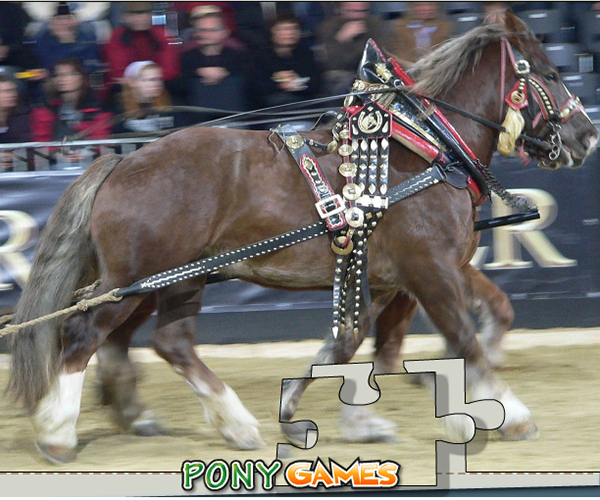 If you like this kind of games you are welcome to play other amazing games in horse breeds category. White markings on the face and the legs are also acceptable.The head is long, shapely and light for a draft breed with a straight or slightly convex profile; large and lively eyes; and small ears. The neck is muscular, short and broad; withers are pronounced; chest is deep and wide; and shoulders are long, powerful and sloping. The body is muscular; the back is short, straight and strong; the croup is sloping; and the ribs are well-sprung. The legs are short with strong, broad joints; well-formed, small hooves; and little feathering. 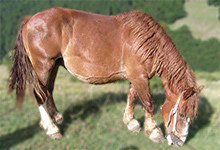 The Italian Heavy Draft is a versatile horse breed, initially used for farming, in the military and for creating mules. Today they are mainly used for meat production in the horse meat industry and for improving the meat production value in other breeds. In some areas they are still used in the agriculture as a work horse and for producing heavy draft mules.Solve a wonderful horse puzzle by replacing the pieces of the jigsaw puzzle. Use your mouse and the final image will reveal an image of a friendly, easy to work with and kind horse breed. The Italian Heavy Draft is docile, but very powerful and speed, having energetic action.. So do not go anywhere, stay on horse-games.org and play thousand of free horse, pony and other animal games.